The Southern Illinois University School of Dental Medicine (SIU SDM) highlighted the important role research plays in the daily practice and continued advancement of the dynamic profession of dentistry during its 2017 Research Day held Tuesday, April 11. 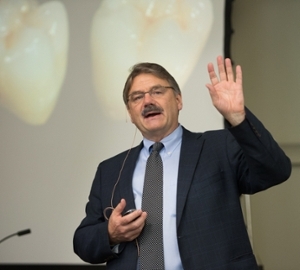 At the School of Dental Medicine, we want our students to have a functional understanding of basic and translational research so they have the ability to make informed decisions as practitioners,” he added. The event’s featured speaker was John A. Sorensen, DMD, PhD, FACP. Sorensen is a professor in the Department of Restorative Dentistry, associate dean of Graduate Studies, director of the Biomimetics Biomaterials Biophotonics Biomechanics and Technology laboratory (B4T) and director of research for the Graduate Prosthodontics Program at the University of Washington School of Dentistry in Seattle. Research Day also featured a Student Table Clinic Exhibition, which featured 13 posters detailing the scholarly work of dental students, as well as resident and faculty-produced research. Pandya conducted her research through the SIU SDM Dean’s Summer Student Research Fellowship (DSSRF), a competitive program designed to introduce students to research. Dentsply Sirona sponsored the first place award, which provides the recipient the opportunity to present their work at the Annual American Association for Dental Research (AADR) meeting. Pandya will present in Fort Lauderdale, Fla. in March 2018. Photo: SIU SDM Research Day featured speaker Dr. John A. Sorensen. 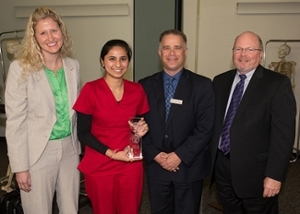 SIU SDM Y2 Vidhi Pandya earned first place during the Student Table Clinic Exhibition. She holds her award, and stands with representatives from Dentsply Sirona Amy Schneider and Joel Pluymert and SIU SDM Dean Dr. Bruce Rotter (far right).